One of the first questions asked when a dealer starts to implement a mobile strategy is “How do I get the word out to my customers to join?” Building your mobile database can seem daunting and slow going but it’s not as complicated as it may seem. And you may already be further along than you even realize. The ability to mine your existing customer data. Online webforms for text club signups. Stand-alone kiosks for customer signups. One of the above methods can yield success. But you should have a mobile provider that offers you ALL these methods so you leave nothing to chance. Customers are different and will interact with your dealership in different ways so it’s best to cover all your bases. A very common and inexpensive feature are mobile kiosks. These kiosks typically consist of a touchscreen tablet and hardware to mount in a prominent place visible to customers. The tablet will display a custom design featuring your dealership and a call to action to draw the customer in with an incentive to join your mobile text club. The touchscreen tablet will allow the customer to input their mobile number and immediately send them a text confirming they joined or have been entered to win a contest. Deploy handheld kiosks at an off-site event by having staff walk around asking customers to join or enter a contest through the tablet. This has proven very successful for dealerships in developing NEW customers. If you have a mobile app or mobile-friendly content you can offer this as well by asking the customer to input their phone number and then send them a link to that content via text message. A kiosk provides a very compelling method that allows customers to “self serve” their mobile needs at their own leisure. You should insist that your mobile vendor provide a provisioned short code and keywords. The short code is a 5 or 6 digit number that has been approved by mobile carriers and is treated like a phone number. If a vendor gives you a full phone number as your communication method you should reconsider that vendor. A phone number is never approved by carriers for text marketing, they are not designed for bulk texting methods and can have countless negative results for your mobile strategy. You should also have the ability to implement multiple keywords without incurring charges for each one. Use different keywords for different promotions so you can measure the success by the responses you receive. 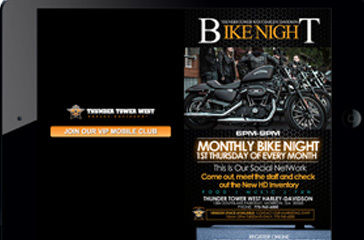 A simple call to action “Text MOTORCYCLE to 55678” is what you will promote verbally and in print and your customers can initiate the text exchange right from their phone. Make sure you also display the appropriate, required legal language anytime you promote a text offer. A good, old fashioned form on your website can be another great way to allow customers to share their mobile number. Customers are familiar with webforms and can simply fill out a few fields and provide great data like first and last name, zip code, gender and mobile number. These fields of data then go into your mobile database and can be used going forward to better target your customers with messages. Make sure you provide webforms that are mobile friendly as well so when your customers are on their smart phone they can still fill your form out and join. Probably the most underused, yet the most valuable asset you have, is the customer data you’ve collected over the years. Customers trust you and have readily provided you with their name, address, phone number, etc… and coupled with their purchases and service records you have an incredible profile of them. The challenge for almost all dealers is what to do with all that valuable information. Do you robocall them? Email blast them? Direct mail? All of these methods are being used today but nothing compares to the effectiveness of a solid mobile strategy. A reputable mobile vendor can work with you on verifying your data. Data can be imported to your mobile platform, then through carrier relationships can verify phone numbers as mobile or landlines. It may not surprise you that 50 percent or more of your customer phone numbers are mobile friendly. Once you’ve completed the verification process you now have an opportunity to invite those customers to join your mobile marketing club by sending them an approved text alert. The FCC gives you legal authority to reach out to your customers you’ve previously done business with via text message. These customers CANNOT be forced onto your opt-in list. They must not be required to take any action to STOP future messages. You must ask them to join by replying YES or Y. And your invitation text alert must clearly identify you as the business that’s communicating to them. Once they respond they are approved as an opt-int customer to receive future messages. You should ask any potential mobile vendor if their system is compliant with the Telephone Consumer Protection Act (TCPA). The added benefit to importing your customer data and getting approval for messaging is now you can use all the additional data on your customers for more targeted messaging. Consider sending messages to smaller groups of customers based on gender or zip code or type of equipment they’ve purchased. Want to message male customers in a 10 mile radius of your store that have not been in for services in the past 2 months? You can do that now with the help of your mobile partner. You will then realize the incredible power of mobile and how you can start communicating with your customers virtually one to one. If you’d like more detailed information on the legal and business aspects for data import please email me and I will be happy to elaborate on this method.